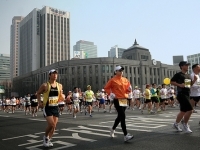 One for the sports enthusiasts, the annual Seoul International Marathon progresses through the heart of the city. The marathon attracts competitors and spectators from all over the world. Visitors should take note that relevant traffic lights are restricted for the duration of the race and that certain roads are closed, which leads to some travel disruptions for those not participating. This slight inconvenience is more than compensated for by the festive atmosphere in the streets and the spectacle of so many people enjoying the race.